In August, the price of emission allowances has risen to over 21 dollars per ton, the highest level of a decade. The EU Emissions Trading Scheme is an instrument for cost-effective reduction of greenhouse gas emissions. The system is based on common EU rules, covering all member states and Norway, Iceland and Liechtenstein. EU emissions trading began in 2005. Since its inception, the system has been expanded step by step and now applies to more industries. Today, some 13,000 European facilities are included in the system, of which about 750 are in Sweden. Many facilities are located in energy-intensive industry and energy production. The trading system has received a lot of criticism over the years but now it seems that Europe finally got it. 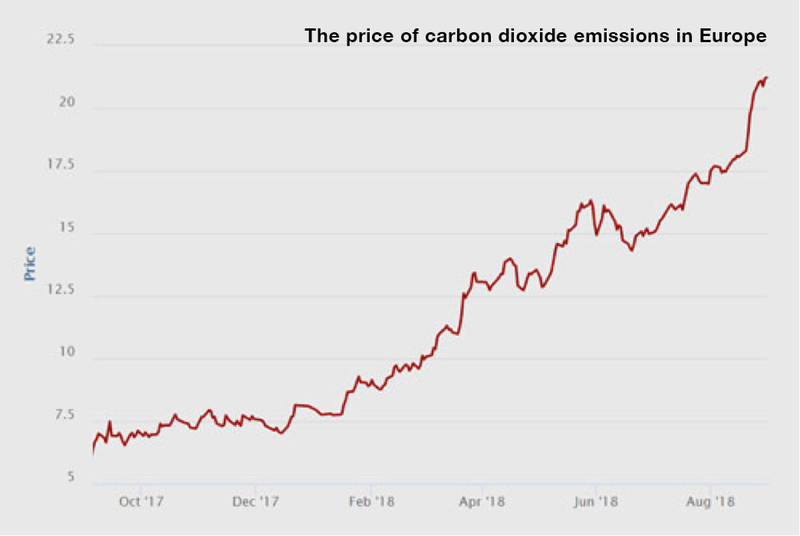 During the third week of August, the price of emission rights to over 20 dollars per ton, the highest level in a decade. But not only that. Costs to generate electricity from both coal and gas have also risen sharply since the beginning of 2017, not least because the price of imported coal and gas has risen. The cost of generating electricity from coal has risen by 72 percent to 46 euros per MWh and the equivalent for gas is 43 percent to 49 euros per MWh. An analysis by Berenberg Bank argues that the shortage of allowances will be able to drive the price up to 100 euros per ton by 2020.